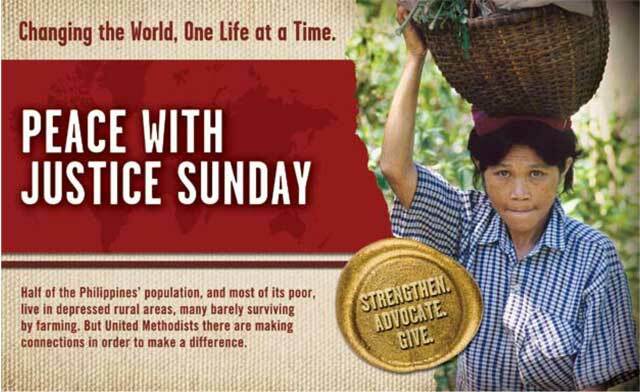 The United Methodist Church Peace with Justice Program aims to make shalom visible and active in people's lives and communities. The Old Testament speaks of God's sovereignty in terms of the "covenant of peace" with Israel, which binds that people of God's shalom (Isaiah 54:10; Ezekiel 37:20). In the covenant of shalom, there is no contradiction between justice and peace or between peace and security or between love and justice (Jeremiah 29:7). In Isaiah's prophecy, when "the spirit is poured upon us from on high," we will know that these laws of God are one and indivisible: "Then justice will dwell in the wilderness, and the effect of righteousness will be peace, and the result of righteousness, quietness and trust forever. My people will abide in a peaceful habitation, in secure dwellings, and in quiet resting places" (Isaiah 32:16-18, NRSV). The General Conference assigned the General Board of Church and Society to implement the program and called the church to "strengthen its capacity to act as a public policy advocate" in communities and nations throughout the world. The 2008 Book of Discipline calls for a Peace with Justice Coordinator to be assigned by every Annual Conference and act as primary coordinator of Peace with Justice resources, interpretation and advocacy. The coordinator links the local churches in the annual conference with the GBCS Peace with Justice Program. Peace with Justice Coordinators meet annually for spiritual growth, empowerment and program resourcing. For more information about the General Board of Church and Society advocacy of Peace with Justice visit their website. The Oregon-Idaho Conference Peace with Justice Coordinator is Claudia Jean Roberts. You can reach her at clarobb@juno.com.